Two-thirds of the way through and you now know the drill! 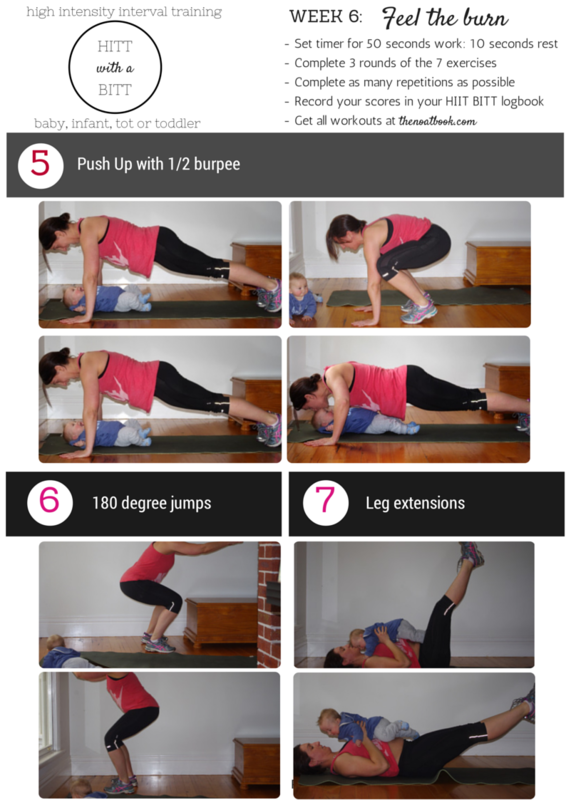 We are up to Week 6 of our 8-week workout series 'HIIT with a BITT' where you get to work out with your baby at home in under 30 minutes. 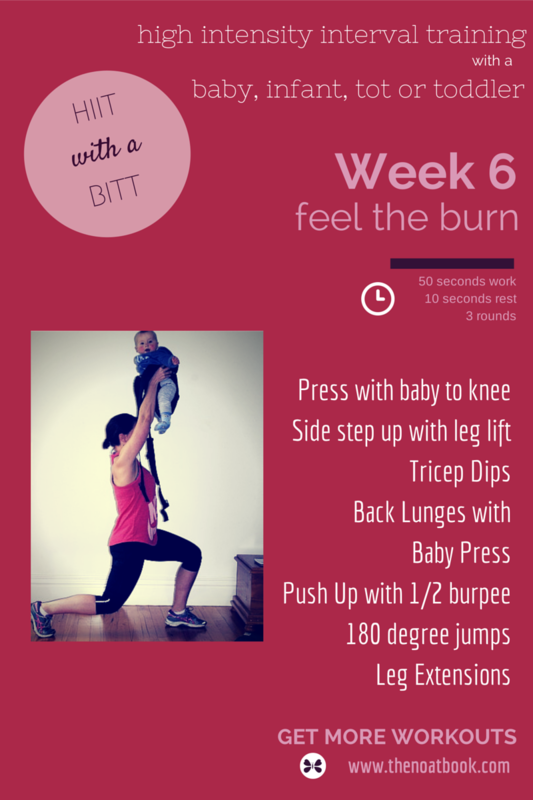 By Week 6 you'll be ready to feel the burn! If this is your first time here, get all of the information about the series here. Ensure your whole foot is on the step. Aim to lift your heel to the ceiling, squeezing through your gluteals. Make it harder: Use a higher step. Make it easier: Eliminate leg lift or use lower step. 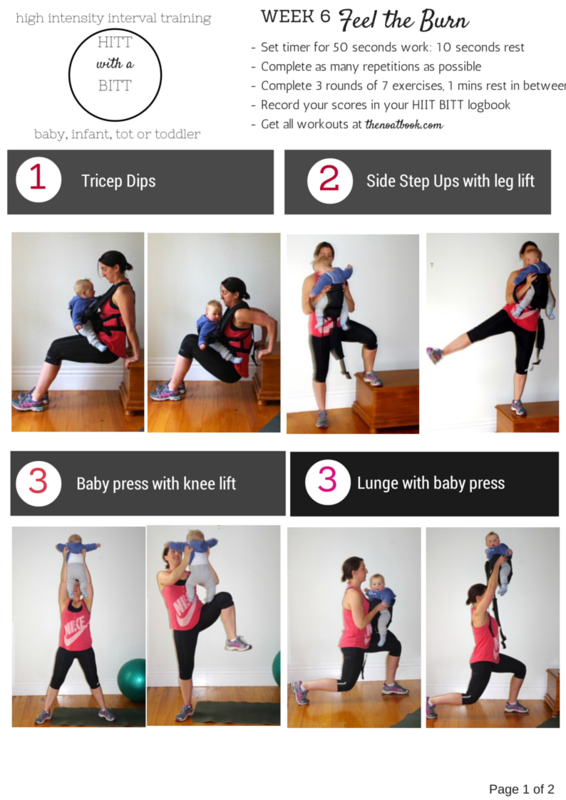 Baby Press with knee lift. Lift your baby above your head. Bring your baby down on one side as you lift your knee on that side to meet your elbow. Hold your baby at chest height. Step backwards into a lunge. Lift your baby up and over your head. Lower your baby back down. Make it easier: Eliminate baby press. Make it harder: Complete one full work cycle on your left leg and one on your right leg. Complete a normal push up. Jump your feet in as if you were about to stand up, but instead jump them back out into a plank position and complete another push up. Jump and tun 180 degrees to face the other way. Use you arms to help propel you off the ground and increase the height of your jumps. Keep repeating as fast as you can. Lay on your back with your baby on your chest. Lift your legs, pointing your toes to the ceiling. Slowly lower your legs to 45 degrees and then bring them back up to the starting position. If your lower back starts to lift off the ground you shouldn't lower you legs any further. Make it easier: Lower one leg at a time. Don't forget to sign up for my newsletter so you never miss a workout!